Update: Judging by the overwhelmingly negative reviews, this product looks good but it's crap. I definitely wouldn't consider it now. No, you don't need a damn case for your iPhone 5—but if you have butterfingers and you must use a case, this seems to me like the only acceptable one. The SurfacePad is not only simple and elegant—complementing the iPhone's design rather than turning it into an ugly hulk or a clear-plastic-wrapped granny sofa—but also has function. And it protects your screen too, unlike 99 percent of the offensively horrible covers out there. 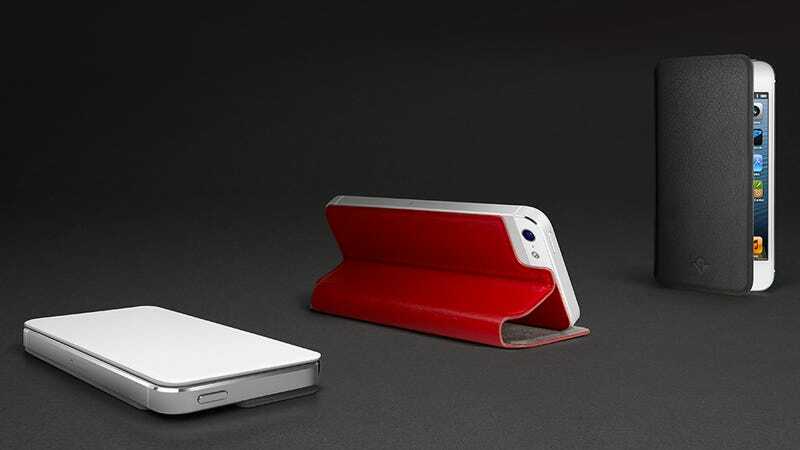 Made of ultra-thin and smooth napa leather, the TwelveSouth's SurfacePad can also serve as a stand. Like the manufacturer says, it's not designed to resist a car getting over your iPhone, but it will protect your mobile against the most common threats without turning its clean lines into a unrecognizable mass of deformed plastic. And for that alone, I applaud them.